Marc (a blog reader) chastized me for implying that there was something wrong with the Big RV Resort. He made some good points about the necessity of full-hookup sites for vintage trailer owners who don’t have gray tanks, and the ease of taking kids to places where there are swimming pools and entertainment. I agree, especially about the full hookups. Our 77 Argosy only had a 10 gallon gray tank, and that just didn’t cut the mustard for more than a day. But on the other hand, there are nice places with full hookups and not-so-nice places. The place we are in is nice in the sense that it is loaded with amenities. It’s clean, comfortable, and well run. It caters to a crowd of Class A and big fifth wheel owners who want all the comforts of home. But there’s nothing here other than the pool and the restaurant. It’s sort of the RV equivalent of a Holiday Inn. The reason to be here is to have a home base to go somewhere else. For Airstream spotters, there’s not much to see. 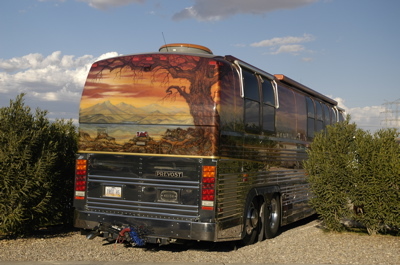 I only found one Airstream, a late-model Safari Bambi 19. The owners were out. But there are a few very impressive Class A motorhomes, including a few Prevost buses which have to cost about a million each. For $33 a night (Good Sam discount rate), I think we are getting a decent deal. If the pool is warm, I might even say we are getting a great deal. (We’ll check that tomorrow if it’s a bit warmer than today.) Normally, we seek out state and national parks that are in themselves destinations, but when visiting a city such as Tucson, the “motel” is a good way to go. We were sorry to say goodbye to Charles and Lynn, but they sent us off in style with a nice breakfast in their 34 foot Excella. 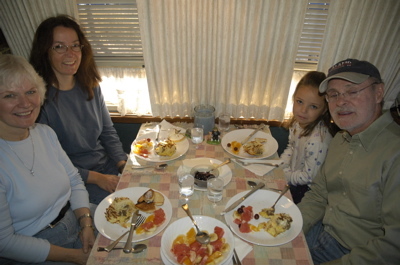 Yes, you can serve breakfast for five on an Airstream dinette — as long as one person is flexible about where they sit. Our travel today was very short. All we needed to do was get down to Tucson, about 60 miles north and 2,000 feet lower in altitude. 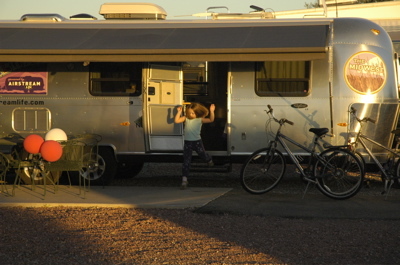 Because we are expecting a guest, we thought it would be a good idea to find a full-hookup campsite, so we ended up at the sort of place we don’t usually go to: a Big Honkin’ RV Resort. Here are the specs: 400 sites, 266 pull-thrus. W/E/S at every site, plus cable TV, a Camping World store, a restaurant, “planned activities” (whatever those are), a mobile power-wash that comes to your site to clean your RV for $3 per foot, two swimming pools, and even some sites with personal jacuzzi tubs. 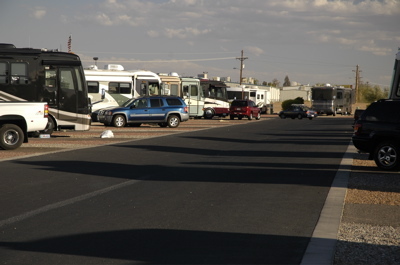 A place like this has nothing to do with communing with nature, or “getting away from it all.” The Big RV Resort experience is about … well, I don’t know what it’s about. It’s certainly not about saving money, since most of our neighbors are in giant Class A motorhomes that cost $100-300k. Our silver trailer sticks out in this fiberglass crowd. 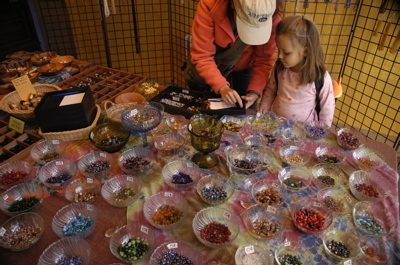 This week Eleanor and Emma are going to try to hit some of the enormous Tucson gem show going on now all over the city. Emma is a nut for rocks and minerals now, and Eleanor has become a fan of opal since our find on the California coast. I hope to join them at one or two of the venues later this week, work permitting. Did you guess what the mining equipment in the previous post was? It was a two-seat “sanitary cart.” In other words, it was the toilet. Keep in mind the temperature in the mine runs 46-52 degrees year-round, and those seats are metal. Plenty of reason to keep your bathroom break short. About an hour’s drive east of Patagonia are Tombstone, “The town too tough to die,” and Bisbee. We left the Airstream parked at 4th and Duquesne, and Charlie reading on a park bench in the center of Patagonia, and took off for a full day of exploration. We had been warned that Tombstone is basically a tourist trap. Imagine something like “South of the Border” with an old west theme and you’ve got it. But we wanted to take a look and give Emma a chance to see a wild west show, so we strolled down the dusty gravel street of old Tombstone. There is some real history here, but you’ve got to look closely. There’s a state historic park in the old courthouse ($5 admission), and many houses have plaques identifying their historic status. But around town you’ll also find a lot of reproduction buildings, tons of merchants with silly names ( “Pony Espresso,” “OK CafÃ©,” etc.) and people in period costumes with cell phones on their gunbelts. It is old west history run ragged. But I should say that the locals were very nice and went out of their way to make sure everyone on the street was having a good time. And there is authenticity still alive in Tombstone. Some of the actors in the wild west show lead long trail rides up into the mountains as their primary vocations. Talking to them about their horses and their love of the open spaces made me realize the western spirit was still alive. It’s just different these days. Still, it took only 90 minutes to feel like we’d seen enough of Tombstone (and that included 30 minutes in the wild west show), so we headed off to Bisbee, 30 miles down the road. Bisbee is a former copper mining town that now seems to be taken over by artists ““ which has made it an attractive and interesting place to visit, especially the downtown. 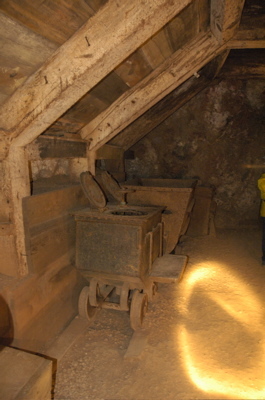 The major attraction of Bisbee is the Copper Queen Mine Tour, which takes you hundreds of feet beneath the surface of a hill to see how copper was mined from the 1800s through the middle of the 20th century. It’s a worthwhile visit, and there’s an RV park right on the premises that gives you easy walking access to downtown too. I won’t give away too much about the mine tour, but here’s one thing you might see in there. Can you imagine what this piece of equipment is for? I’ll tell you in the next blog entry. Mystery equipment in the mine? 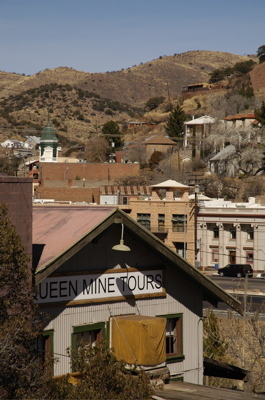 There’s a lot to check out in Bisbee, so perhaps we’ll go again later this week. But we’ve got a lot on the schedule, including Kartchner Caverns, Pima Air Museum, and some great hiking. It’s going to be tough fitting it all in. Plus, we’ve got a houseguest coming on Thursday ““ or is that trailerguest? I’ll tell you about that later this week too. Did I mention it’s cold here? The locals are swearing it’s just a spell, and “it hardly ever gets this cold,” but every night the low temperature seems to be lower, and three nights in a row our water hose has frozen solid. Fortunately, it warms up nicely during the day, so Eleanor and Emma are able to walk about town and take care of business (laundry, post office, playground). They also spent half a day trying on Emma’s clothes and bringing a huge pile of stuff that she had outgrown to the local Thrift Shop. Meanwhile, I’ve been working so much in the Public Library that all the librarians know me and I have a regular space. 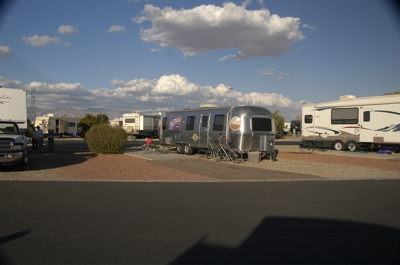 The world headquarters of Airstream Life are at the square table by the window, first room on the left. There’s not much in the way of grocery shopping here, so we took advice and headed 19 miles south to Nogales (AZ) to visit the big stores there. Nogales is actually a big town with all the usual big-box development. But it’s like visiting Berlin before the wall fell; the city is divided by a giant fence. Across the fence lies Mexico. Of course we couldn’t resist taking a peek, but overall it was disappointing. If you take the lesser-known east entrance off the end of Morley Ave, you end up in a sleazy bar/massage parlor district. If you cross over the train tracks and take the west entrance by the big US Customs Building, it is exactly like downtown Tijuana: streets lined with vendors, all selling the same junk. Silver jewelry with questionable stones, pottery, prescription drugs, leather bags, dust collectors, and then they repeat over and over again. For some reason I found myself buying a “wool” poncho made of, I believe, acrylic. Probably it was the thrill of haggling over the price that motivated me. I ended up with it for $21 and a sense that if I wore it anywhere in the southwestern states I would cause locals to snicker. The bargains are better at Wal-Mart. There isn’t much in Patagonia for Emma, so we are going to move out a couple of days earlier than planned. Sunday is set for a visit to Tombstone and Bisbee, then Monday we will move up to Tucson for hiking, museums and whatever else Tucson has to offer. Did I mention that Patagonia is at about 4400 feet elevation? It does get pretty nippy here at night. 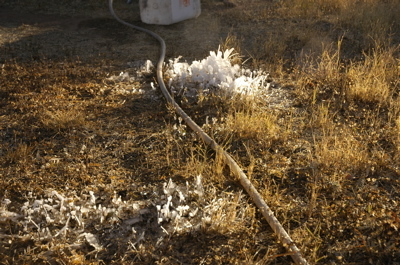 This morning I woke up to find our water hose frozen. The hose we used (one of those roll-up types you can get at Camping World) has developed some tiny pinholes over the months, and so it acts as a sort of ground watering system. You can barely see the miniature sprays, but this morning their existence was made very clear by the little ice formations in the lawn. Time to get a new hose. Over the past few days I’ve talked about the nearness of Mexico and how it influences life along southern Arizona. But nowhere has this been more apparent than here in Patagonia. Because of the rugged terrain, the border here is very porous. The Border Patrol maintains a huge fleet of vehicles in the next town, Sonoita, and they have all the toys: night-vision goggles, ATVs, paddy wagons, cruisers, trucks, and helicopters. Still, I am told they catch only one in ten. Last night while I was sitting in the dark on a bench outside the Public Library (snarfing the free wifi signal), a DEA or Border Patrol helicopter came by and began circling the town at low altitude with a multi-million candlepower spotlight. They hit me with the light a few times as they passed, in their hunt for drug runners from Mexico. Somewhere, perhaps only a few hundred feet away, someone was hiking north with a 60-lb sack of marijuana on his back, trying to evade the infrared eyes of an observer in the right seat of a Blackhawk helicopter. It’s commonplace to see Border Patrol trucks off the highway every night, spotlighting and capturing “mules” (drug couriers) and UDAs. Hike into the backcountry and you’ll see piles of trash dumped where they walked the dry washes in the dark. They have no interest in Patagonia — it’s just the first of many towns they must pass to get to the American Dream. But we don’t see the people themselves. They are, like the poorest third of this town, a subtle presence most of the time. The one time they are visible is when walking south. A drug courier, having made his drop, walks home again along the roadway. At one time the Border Patrol used to pick them up and deport them, but then realized they were just becoming a free taxi service for drug runners. So now, if they spot somebody heading south, they let them keep walking. All these little intrigues go on around us, but Patagonia takes little heed. Our courtesy parking spot under the big mesquite trees on the corner of 4th and Duquesne is quiet, and we have been undisturbed. 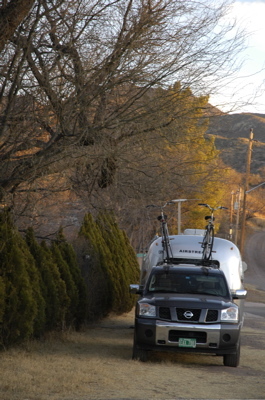 The locals slow down and stare at the trailer as they go by, but nobody has had the temerity to knock on our door yet. Still, I am reliably informed that everyone in this small town knows we are here. We may have an Open House later this weekend, just to satisfy curiousity. We wandered the town Wednesday night to see some of the eclectic features. 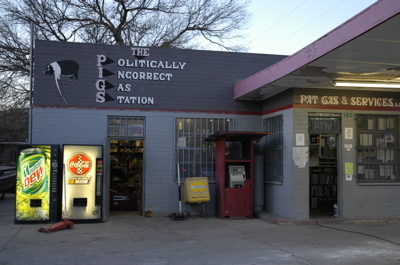 There are many: the “Politically Incorrect Gas Station” (PIGS), the one-room Museum of the Dead, Velvet Elvis Pizza Parlor, Dos Palmas Vacation Resort, the combination nightclub and community center, and the backyards filled with “antiques” of all descriptions. Patagonia has layers of complexity in it that we have barely begun to appreciate. It is without a doubt the most peculiar town we have visited in the past four months. Would you like to join us for a mini-caravan? Check our Schedule page to see where we will be in the next three months. If you can cross paths with us for a few days let us know by clicking the “Contact Us” link. Charles was right. Patagonia is a very interesting place. From one perspective, Patagonia is severely divided by economics. At least one-third of the community is fairly poor. You see their homes in the midst of town, sometimes neat but careworn, other times ramshackle and cluttered with decades of now-worthless possessions. It seems nearly every tiny town lot has an old travel trailer in it parked next to the house, with expired plates and cracked windows, yet often these trailers are still being inhabited full time by an in-law or cousin. Another significant slice of the community is very wealthy. They own substantial ranches around town, and tucked up in the hills. These are multi-million dollar properties, but most are merely second homes for their owners, who fly in from California, northern Arizona, and even Austria. For some, raising cattle on these “show ranches” is probably a sideline that allows the owner to say he owns a working ranch. Others have dispensed with even that pretense and live in elaborate glass-sided architectural creations perched atop hills, surrounded by acres of mesquite trees and tall grass. But the real story of Patagonia is its history, which permeates the place so thoroughly that a walk down the block brings up a thousand stories. Nothing in Patagonia seems new. Thankfully the town was never large enough to suffer the scourge of “urban renewal” and modernization in the 50s and 60s. Some of the locals live in adobe houses that are probably 50 or more years old. Almost everything standing is historic, and just a few miles out of town you can find the remains of abandoned mining towns that held 1,000 or more people for a few brief years. The library, where I walk each day to borrow their free wifi, is housed in the former Patagonia Hotel, built by a former solider, John Cady, starting around 1900. He wanted to build the finest hotel of its type west of the Mississippi, and after years of expansion, he finally did it. Across the street is a marvelous old western-fronted building with “Lopez Pool Hall” in faded paint on the facade. Next door is a beautifully restored home that has become a B&B, and across from that is the Dos Palmas “vacation home”, a restored 1958 Spartan Imperial Villa permanently parked behind a fence. It’s pretty cool looking from the outside. (See the website for pictures). Patagonia is a funky amalgam of artistic vision, American history, and graceful decay. People come here for that. There are adobe houses and wonderful western-fronted storefronts are filled with artists and accomplished “dropouts” from all over the world. Late at night we see the glare from a welder who is making incredible sculptures from reinforcing steel bars. Charlie tells us stories of nearly everyone who is here: the chef from New Orleans (displaced by Hurricane Katrina), the fellow who dropped out so thoroughly his friends held a funeral for him and placed a gravestone in the local cemetary (he’s still alive), the heiress with the dude ranch, the Austrian Count’s wife who loves giant concrete balls, and the local fresh-vegetable cult. This place is a writer’s dream, stories everywhere. I’ll post photos from all over town in a day or two. Meanwhile, I’ve got to catch up on the Spring magazine issue and work out some plans for our next few weeks. We will be heading to the Tucson area next week, then traveling through southern New Mexico and heading to a rendezvous in west Texas. Before we left Organ Pipe Cactus National Monument, we stopped at the Visitor Center one last time. Emma had completed all the requirements for her first Junior Ranger certificate, so we went in to have her take the oath and receive her badge. She’s very proud of it. The Tohono O’odham Indian Nation was quiet. Lots of open road, not much to see or visit. I didn’t score any prickly pear jam, sadly. 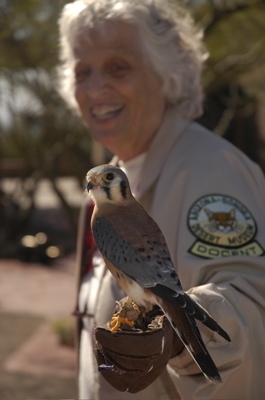 We ended up a few hours later at the amazing Arizona Sonoran Desert Museum just west of Tucson. That place is fantastic ““ highly recommended. It’s a superb place for taking wildlife photos. I captured a few more hummingbird shots, as well as many other creatures and plants. (Check out the new photos I uploaded.) We stayed until closing, and then headed another two hours to our destination: Patagonia, AZ. Why Patagonia, a off-the-beaten path western town up in the hills? I’m not sure yet. Our friends Charlie and Lynn winter here and they’ve raved about the place. It seems to be one of those rare “undiscovered” gems, far enough from the cities and off the beaten path enough that it doesn’t get a huge influx of tourists, yet genuine, historic, and friendly. So we took Charlie’s advice and came down. The offer of free courtesy parking with water and electric had nothing to do with it “¦ but it was a nice incentive. We’ll stay until the end of January, and then relocate up to Tucson for a few days.